Illinois Green's Drink Up & Drawdown networking event series is back for 2018! We'll be discussing ways we an all engage in carbon drawdown solutions over cocktails on the second Wednesdays of the month (with the exception of May) throughout 2018 - mark your calendars! 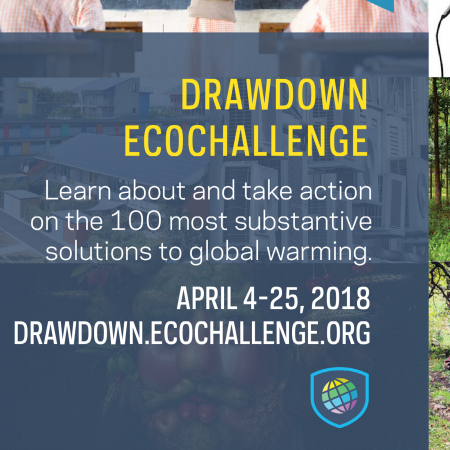 April's Drink Up & Drawdown event will focus on our participation in the Drawdown EcoChallenge. We'll cover carbon reduction activities you can be doing at work or at home during the month of April (and all year long!). We'll focus our discussion in on some specific strategies and their impact. We hope you'll join us on 4/11 to learn more! You can join the Illinois Green EcoChallenge team and choose among 100 actions to help curb climate change. As you accomplish your challenges, our team earns points and could win some sweet prizes, like a hour-long video session with Paul Hawken!